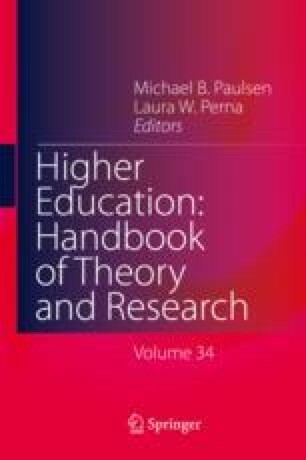 The purpose of this chapter is to consider the range of visual theories and methods that have been, or could be, applied to the study of higher education organizations. In framing this discussion, we take a multi-disciplinary approach to draw upon the various disciplinary and interdisciplinary traditions that have influenced higher education scholarship to date. We are especially interested in those areas of study that have contributed to our understanding of higher education organizations, such as anthropology, geography, and sociology. Our aim is to provide researchers with a comprehensive overview of the literature that surrounds visual research methods pertaining to the study of higher education institutions, their organizational identities, dynamics, and change. We expect that future higher education research would not merely apply visual theories and methods from other fields and disciplines, but will instead expand upon the existing literature base with our field’s own empirical and creative research practices. Alexandersson, A., & Kalonaityte, V. (2018). Playing to dissent: The aesthetics and politics of playful office design. Organization Studies, https://doi.org/10.1177/0170840617717545. Bates, E. A., Kaye, L. K., & McCann, J. J. (2017). A snapshot of the student experience: Exploring student satisfaction through the use of photographic elicitation. Journal of Further and Higher Education, 1–14. https://doi.org/10.1080/0309877X.2017.1359507. Everett, M. C. (2017b). Using student drawings to understand the first-year experience. Journal of College Student Retention: Research, Theory & Practice, https://doi.org/10.1177/1521025117696824. Metcalfe, A. S. (2018). Thinking in place: Picturing the knowledge university as a politics of refusal. Research in Education. https://doi.org/10.1177/0034523718806932. Pink, S. (2008). Mobilising visual ethnography: Making routes, making place and making images. Forum Qualitative Sozialforschung/Forum: Qualitative Social Research, 9, 3, Art. 36. https://doi.org/10.17169/fqs-9.3.1166 . Thompson, N. A. (2017). Imagination and creativity in organizations. Organization Studies, https://doi.org/10.1177/0170840617736939.